Uber, Visa and Barclays recently hosted an event in Los Angeles designed to promote the rich benefits of a new credit card. I accepted an invitation to fly in, dine with execs, spend the night at the SLS hotel and learn more about it. This occurred before Uber’s recent data breach was revealed, so I held off on publishing this post until the storm began to clear. 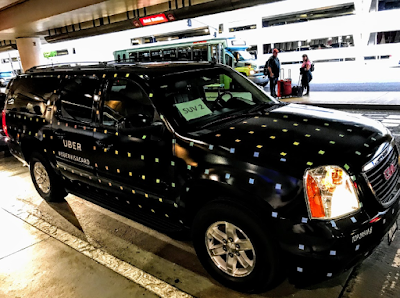 Uber’s is only the latest of many data breaches affecting frequent travelers in recent years. While the company says that the data hack only exposed user names, email addresses and phone numbers, it is still disconcerting. So is your credit card application information safe with Uber? Well, after poking around a bit I found out that Uber does not actually store any credit card numbers or application information at all, it’s all handled by banks and payment processors according to a spokesperson. So why in the world is a ride share company getting into the credit card biz? Well, of course Uber wants to offer a practical and valuable product to its customers. But on its road to profitability, a key reason is money. Despite some recent, well-publicized bumps, Uber has broad brand recognition and a loyal, lucrative and spendy customer base. Banks are eager to tap into that crowd, and are willing to pay Uber handsomely for access to them. With the new Uber Visa Card issued by Barclays, the ride-sharing company has jumped into the co-branded credit card space just like big travel brands like Delta or Marriott, which have earned millions if not billions of dollars with their co-branded cards. It’s a win-win-win situation: Banks get access to big spending frequent travelers, travel brands and processors like Visa earn money on each transaction, and travelers get a card with a rich roster of benefits. - Sound like you? It sure sounds like me. The new card has a $0 annual fee. That’s surprising considering its benefits. Use it to dine out and you get 4 percent back. Put your airline and hotel (or Airbnb) charges on the card and you get 3 percent back. Online shopping and Uber rides earn 2 percent cash back, a bit of a surprise to me I would think they’d earn 4 percent since this is the Uber card. In addition to what you get back, bennies include a $50 credit you can apply to your annual Netflix, Spotify or Amazon Prime among other subscriptions. Pay your phone bill with the card and you get $600 in insurance in case of loss or theft. For globetrotters, there are no irritating foreign transaction fees– very rare for a no-fee card. To get these add-ons, you must spend at least $5,000 per year on the card. As an incentive to sign up, if you spend $500 in the first 90 days and you get $100 10,000 points in credits. But perhaps what is most interesting about this card is how you sign up for it. You can do it the old way of course. But get this: you can sign up for it within the Uber app, which pre-populates your application with pertinent info, leaving only a few key blanks for you to fill in. Uber suggests you sign up for the card during your next Uber ride, and says it’s likely you’ll be approved for it by the time you get out of the car. Try that and let us know if it worked! Have you or would you get the Uber Visa card?